MPLS is a mechanism in high-performance telecommunications networks that directs data from one network node to the next based on short path labels rather than long network addresses, avoiding complex lookups in a routing table. The labels identify virtual links (paths) between distant nodes rather than endpoints. MPLS can encapsulate packets of various network protocols. MPLS supports a range of access technologies, including T1/E1, ATM, Frame Relay, and DSL. Enable MPLS on the provider backbone. Create VRFs and assign routed interfaces to them. Configure MP-BGP between the PE routers. Configure EIGRP between each PE router and its attached CE routers. Enable route redistribution between the customer sites and the backbone. Review of basic router configuration. 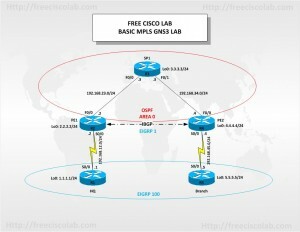 Review of configuration of OSPF and EIGRP routing protocols.